If there’s one thing I love about warm weather, it’s all the pretty flowers and greenery that come out to play. From roadside wildflowers to manicured flower beds to indoor bouquets bursting with fragrant petals and sumptuous colors, I can’t get enough. If you feel the same way, you’ll love the floral inspired hairstyles featured below. Some utilize fresh flowers, some call for faux blossoms and others are simply inspired by the floral form. This one’s easy enough, but holy moly does it pack some major wow! The look comes to you from Sarah at The Green Dandelion Blog, who says, “I decided to wear [acacia] in the most simple way imaginable: I just tucked pieces of it into my hair.” While Sarah has a thing for the yellow florets, she says that almost any flower can be worn this way. First create a loose French braid, then strategically place flowers throughout. To help the flowers stick, spray a little hairspray on the end before inserting. This soft and feminine updo by YouTube user “Harsh T” looks super complex and difficult, but I promise it’s much simpler to recreate than it appears. There aren’t any actual flowers used, but the end result offers a subtle allusion to pretty buds. You start by twisting hair from either side and pinning at the back of your head. Then you create two rope braids, twist them into buns and secure with bobby pins. Very pretty! 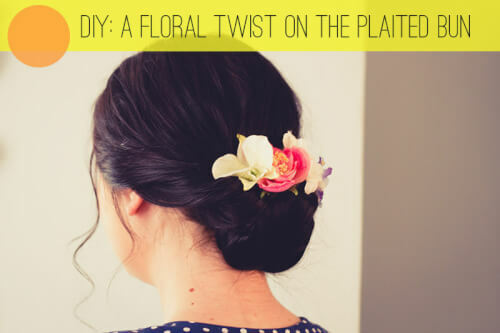 Perfect for either fresh or faux flowers, this “Floral Twist on the Plaited Bun” by Bespoke-Bride is sure to earn you admiration from near and afar. The whole look is very thoroughly explained (complete with pictures) on the blog, so check it out. And while this look is featured on a bridal blog, note that it can be worn to all sorts of formal events. Okay, this one is for all you hair experts out there who want a little bit of a challenge. It’s a little more complex than the other tutorials here and will require some patience and time on your part, but the end result is supremely lovely. I think it’s perfect for formal and semi-formal events throughout the warmer months. Check out YouTube user MakeupWearables Hairstyles‘ video tutorial for all the info. This flower-inspired hairstyles roundup would be remiss without a floral crown tutorial, don’t you think? The Internet is literally saturated with them, so head on over to The Google and search for a style that suits you. 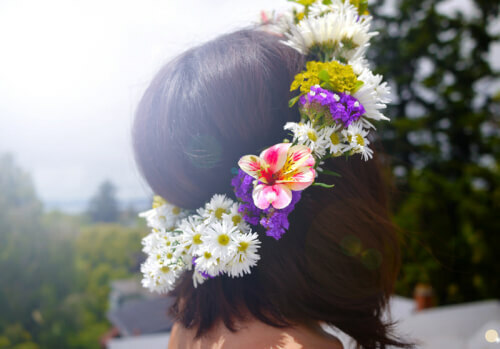 I personally fell in love with this “DIY Midsnummer Flower Crown” by Erica at HonestlyWTF.com, partially because it’s so vibrant, and also because it’s easy enough for my clumsy fingers to figure out. Feeling the flower power already? 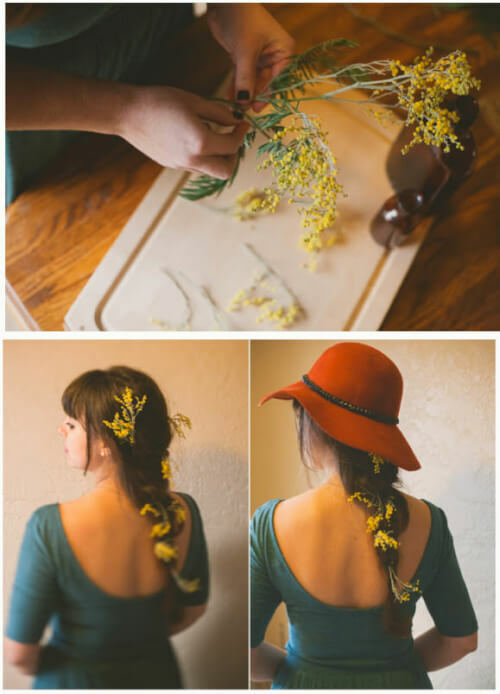 Then you’ll love this simple flower braid tutorial!